Fall has arrived, and right behind it comes… Halloween! Our favorite time of year! If you are like us, you are probably already planning your costume and scouring store shelves for props. If gore is part of the plan for your Halloween hi-jinks, you are going to need blood. 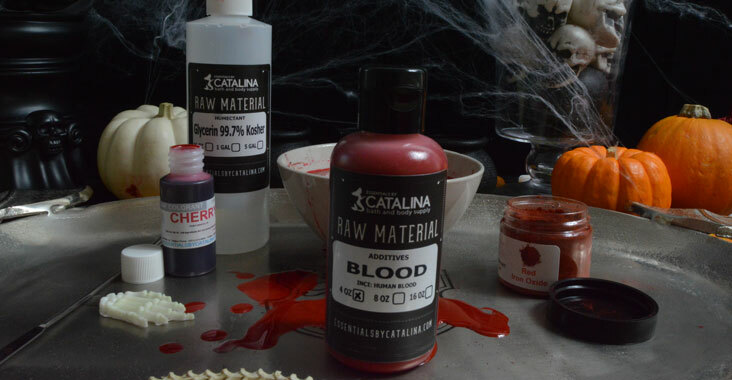 That’s right; oooey, gooey, flowing and horrifying, realistic fake blood will take your costume or display to the next level! 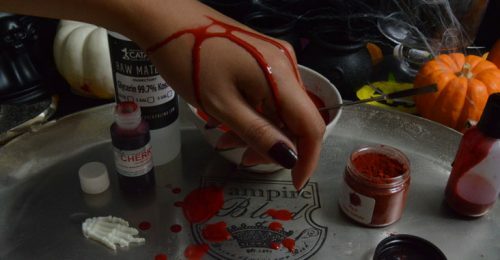 Good quality fake blood can be pricey to purchase retail, and may very well have a questionable ingredient list. 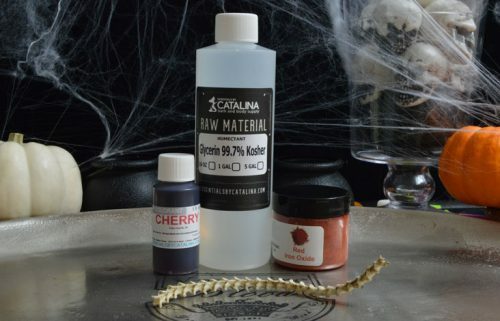 This fake blood tutorial is simple, customizable and cost-efficient, which is great for big haunts as well as elaborate costumes. This fake blood is for external use only! DO NOT GET IN EYES OR MOUTH. This recipe makes a thick, dark red blood. It looks great for splatters, spills, and as an accent to any gory costume or display. 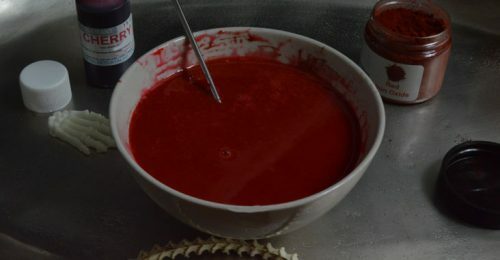 Since this recipe uses Iron Oxide, the blood does not stain skin like store-bought fake blood containing dyes will. Only these three Ingredients are needed. 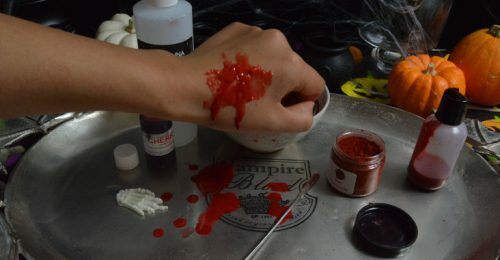 Optional: You can make this fake blood scented! Scent it with fun fragrances such as Cherry Almond or Apple. We recommend not going over a fragrance load of 0.3% if it is going to be used near the face. The result is a thick, dark, realistic blood. Perfect for costumes or decoration. Simply mix all of the ingredients together at a low speed in a stand mixer. Low and slow is the way to go for this recipe. Feel free to adjust the colors accordingly. 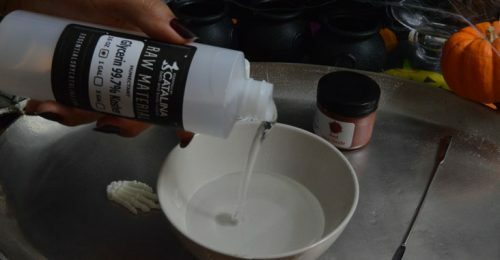 Add the desired amount of glycerin to a mixing bowl. Add the Iron oxide and cherry colorant to the glycerin. Once it is all mixed it will be a gorgeous crimson. 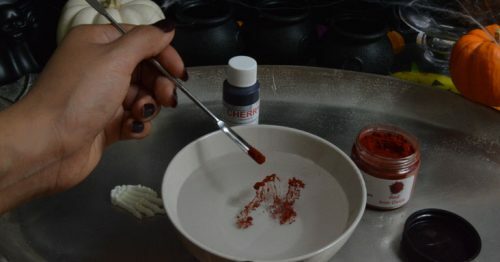 For a scented variation, mix the fragrance then simply add it into the fake blood mixture. Fake Blood Added To The Hair Gel. For a chunky coagulated look add about 5% of the blood mixture to our Super Hold Styling Gel. A four ounce of stage-quality blood will cost about $7 retail. This recipe costs out to about $3 a pound! What a difference! A Gallon of Glycerine is $16 which comes out to $1 an ounce. The cherry soap colorant is $3.25 for a one-ounce bottle, and a little goes a long way. The most you would need is .25 ounce, which would cost .80 cents. And a 2-ounce jar of iron oxide costs $5 and you would need about 2 teaspoons which is about $1. So the larger quantities you buy, the more you save.